As the name suggests, this spacious family sized tent comes in a one-man sized package. 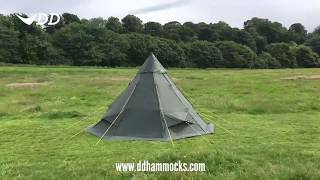 Our first group tent with ample space for 3 adults or a young family of 4, including everyone's gear, the SuperLight Tipi is a practical, lightweight and high performing tent fitting easily into most rucksacks. This lightweight family sized tent - offering comfort and style in equal measures - packs down to an incredibly small size, weighing in at under 2kg (excluding pole). Perfect also for bike tourers, Scouts, festival-goers and road-trippers alike! 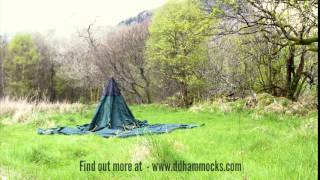 Consisting of a single-layered body, and separate floor, the DD SuperLight Tipi needs only a central adjustable pole (included) to raise the centre, and 19 pegs (27 included) to attach the tent floor/peg out the sides - allowing it to be quickly and easily set up even by one person. Includes a 4 piece adjustable support pole (max. height of pole is 220cm, folding to 60cm lengths). Note: Tipi height should be set approx 200cm (depending on pitch of ground, can be adjusted between 190cm - 210cm).